1967 proved to be the Turtles' most successful year on the music charts. "She'd Rather Be With Me" reached number 3 on the US charts in late spring and actually out-charted "Happy Together" overseas, reaching # 4 in the UK. 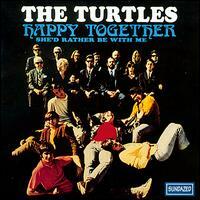 Happy Together is the fourth studio album by The Turtles. It was released in April 1967 on the White Whale Records label. In the CD era, it has been reissued at least three times, with various track configuration. The Turtles are an American rock group led by vocalists Howard Kaylan and Mark Volman. The band became notable for several Top 40 hits beginning with its cover version of Bob Dylan's "It Ain't Me Babe" in 1965. The group scored its biggest and best-known hit in 1967 with the song "Happy Together".